Tuna sandwiches make for a great light snack or accompanyment with a bowl of soup for a full meal. Of course there are many variations for making a tuna sandwich. You can add or substitute just about anything but for the purposes of this article, we’ll stick with the basics for making your tuna sandwich. Open your can of tuna with the can opener but keep the lid. Over the sink, press the lid down onto the tuna in the can to force out as much of the liquid as possible. Otherwise your tuna mixture will be too sloppy. Next, finely chop up your half of a small onion and place it into your bowl. Add your tuna and 1/4 cup of mayonnaise. You can use low-fat mayonnaise but I prefer the normal kind because it just seems to taste better. Now stir it up until you have a creamy mixture. Thinly slice 3 or 4 pieces of tomato and enough shredded lettuce for one sandwich and arrange it on one of the slices of bread. Then scoop out half of your tuna mixture and spread it evenly on top. Add salt and pepper to taste and place the second slice of bread on tip. Cut your sandwich in half diagonally to make two triangles and serve on a plate with some sliced tomato or green olives on the side. 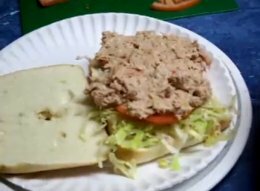 There are many different ways to make a tuna sandwich. You can use dijon mustard half and half with the mayonnaise for some extra flavor or chop up olives and add instead of the diced onion. However you make it, tuna sandwiches are quick, tasty and healthy.